featuring latest updates on Player of the Month, travel, ticketing and the forecasting competition. 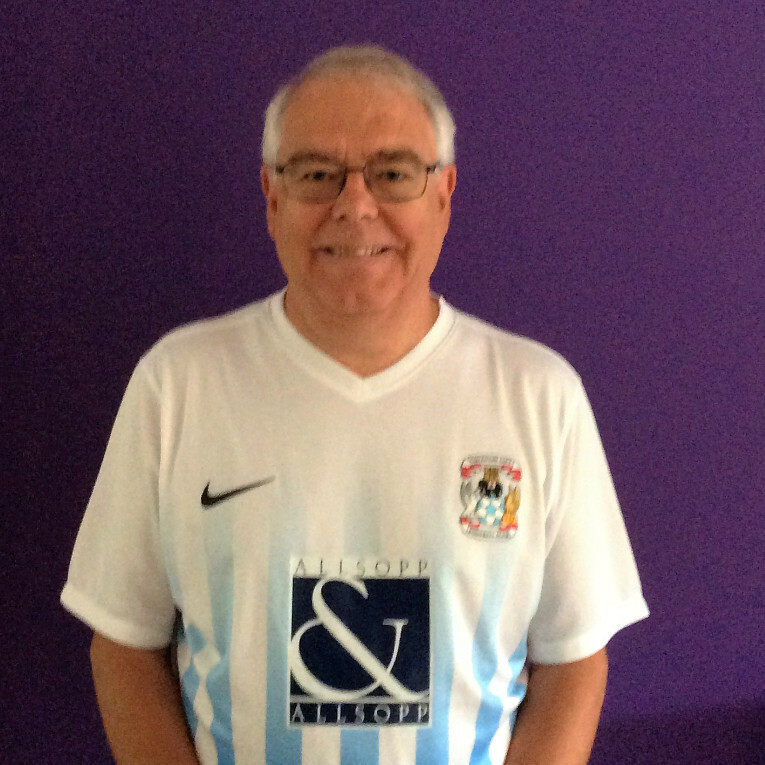 February saw a glimmer of hope for long suffering Sky Blues supporters. The win against Wycombe, in the semi final of the Checkatrade Trophy, will see the Sky Blues return to Wembley for the first time in 30 years. The sad fact is that by the time the 2nd April comes around, our fate in the league may well have been decided. Regular travellers are always most grateful to Barry Chattaway for the tireless work he does in collecting tickets for away games. This enables CCLSC members to sit together, on the often long trips around the country. However, in February Barry certainly went the extra mile to ensure that as many CCLSC members as possible could be together at Wembley. Barry also facilitated ticket collection for several SBI members. The hours of behind the scenes administration that Barry undertook to get the 190 of us seated together was nothing short of outstanding. Charles and Colin also deserve a big thank you for their work ensuring CCLSC had sufficient funds to purchase the tickets. Once again thanks should also go to Shelagh, from the Butts Ticket Office, for all her help working with Barry to achieve this. Thanks must also go to those CCLSC members, who are season ticket holders, and who were not going to use their full allocation of tickets and offered these to other CCLSC members, who wouldn't have been able to obtain tickets at priority. With Ticketmaster sending tickets direct to season ticket holders, Barry will be on the case getting tickets to the right person. We would ask all members now pay for their tickets by making a transfer directly into the CCLSC Bank Account. Members whose tickets we have obtained using season ticket holders unallocated tickets, will be sent the costs of their tickets and associated Ticketmaster fees, in the next dew days. Back to the reality of the League. The poor results continued. At Oldham, after another poor defeat, we suffered a horrendous train journey home. Not only were we severely delayed on the way back to Euston but the train was full of Man Utd supporters (well they went to the game and the shop by the looks of it), Watford and Palace fans. Another late goal cost us points, this time at Wimbledon. We eventually got a win, and played well in the first half at least, to win 2-1 against Gillingham. It was then two more deeply disappointing displays against fellow strugglers Swindon and Bury. We continued to leak goals, in fact almost identical goals, through the centre of our defense. The second half displays at both games were better but late goals were just too little to late. February also saw the Club Accounts, for the period ending May 2016, issued. They showed Coventry City made a £700k profit, after player sales, but had liabilities of £44m. It has no major creditors other than the club's owners, who according to the independent auditors BDO, didn't take any money out of the club and made a commitment not to call in any loans or interest in the "foreseeable future". Whilst the club is being run as a "going concern" this season, the accounts did make the point that additional funding from the shareholders was likely to be needed in the next 6 months. With relegation all but mathematically confirmed, the ability to fund the close season, and then fund a new squad, means it is a worrying time for Sky Blues supporters. All we can do is #Keep the faith. Wembley - Pre match drinks? 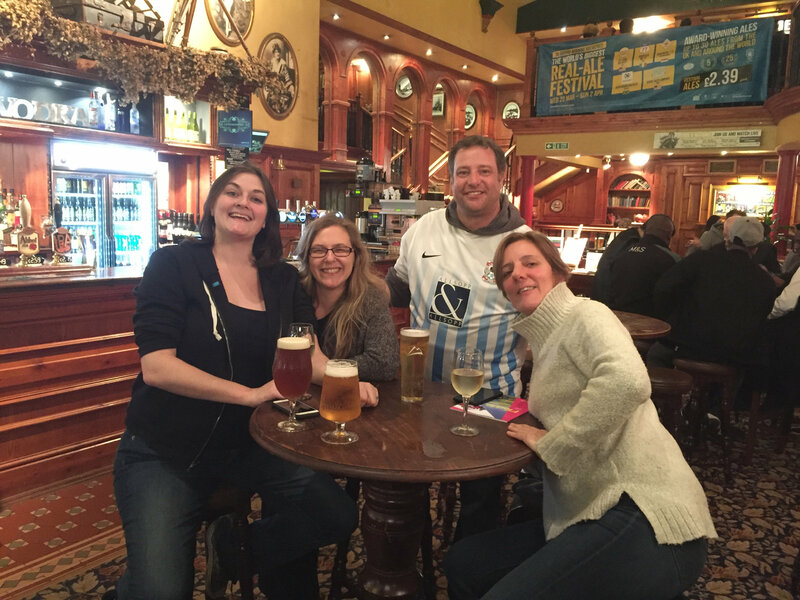 We are looking to gather for pre Wembley drinks in central London. Interested in joining us? Adrian, the landlord at the Calthorpe Arms and long standing CCLSC member, is opening his pub early, at 11 am on Sunday 2nd April. We hope that many CCLSC members will join us for a drink before leaving for Wembley. Kings Cross is only a few minutes walk away from the Calthorpe, with direct tubes to Wembley. To help Adrian with staffing we would like to give him an estimate of numbers. Adrian is happy to offer food that Sunday, and whilst he usually only offers a limited Sunday menu, he will extend this if sufficient demand, but only on a pre ordered basis. Please can you let me know if you intend on joining us at news@cclsc.org.uk ? Membership provides discounted travel to games, an away match ticket collection service to enable members to sit together, a monthly newsletter and invitations to socials and Q&A evenings with club officials. Membership this season, certainly proved it's worth for members in obtaining Wembley tickets. For more details on CCLSC speak to a committee member at one of the designated pubs or at the games. 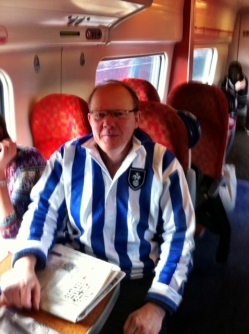 Simon is again providing group train travel to Saturday home and away games. Travel to Saturday home games will need to be pre booked three weeks in advance again this season and to get sensible prices for long distance away games, tickets will need to be purchased up to 12 weeks beforehand. Check the website http://www,cclsc.org.uk for the latest travel information throughout the season and the monthly newsletters will continue to provide details. Requests for travel for the following games need to be made before the next newsletter is published. Peterborough (home) Sat 8 April. Deadline is Thursday 16 Match. Note: There is no group travel to the midweek home games at Southend or Por Vale in March nor the re arranged away game against Sheffield United. With the midday kick off for the last game of the season at Scunthorpe, on Sunday 30 April, there are no Sunday trains from London that will arrive in time for kick off. More details to follow. Travel has now been booked for the following games:. Details of train times and prices obtained are shown below. They can also be found on the CCLSC website under travel, if anyone wishes to now book their own travel arrangements. Bradford City (home) Sat 11 March. Group travel on 11.03 and 1751 £13.40 adults £9 concessions. We will continue to obtain away tickets at the priority stage, wherever possible, for members who request tickets. If you are wanting tickets for away games let Barry know well in advance and don't wait until they are on sale. The Ticketmaster process doesn't always allow time for us to contact members who haven't requested tickets. Match tickets for the MK Dons and Rochdale games are likely to go on sale before the next newsletter. Make sure you are on Barry's list so he can attempt to get everyone tickets at the priority stage. Congratulations goes to Callum Reilly, who is the CCLSC Player of the Month for February. The loanee from Burton Albion picked up just under 100 votes during the month, to finish ahead of City Academy youngsters, George Thomas and Dion Kelly Evans. 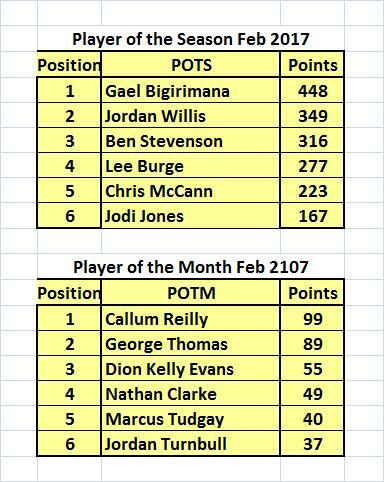 Gael Bigirimana, still has a commanding lead in the Player of the Season table, despite not picking up a single vote in January or February, and now looks to have an unbeatable lead. The latest top six are shown below. February proved to be yet another generally painful month in terms of Sky Blue results, but as far as the CCLSC prediction punters were concerned it was a very mixed bag indeed. While some competitors continued to score very poorly others seemed to thrive amongst the agony. 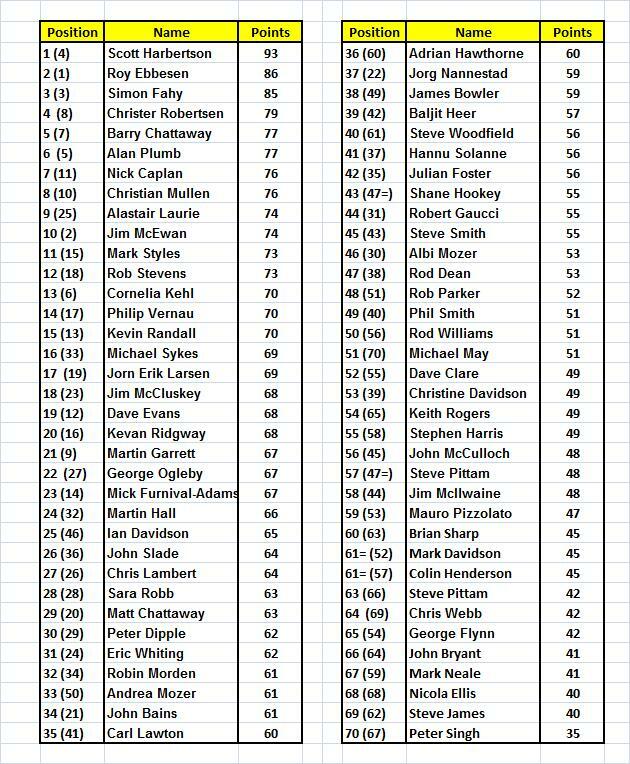 Competition newcomer, Scott Harbertson, for instance, has now raced to the top of the table (and with a clear 7 point lead) following a month where he predicted 5 out of the 6 results correctly - gaining two more maximum 6 pointers - Wimbledon and Bury - whilst doing so. Simon Fahy, now, catching up the top two, in third place also picked up a couple of 6 pointers - Gillingham and Bury. Sykes, Jim McCluskey and Bal Heer. only three points over 12 games. 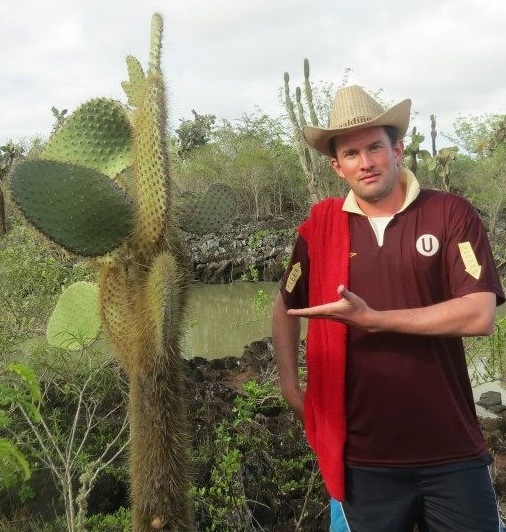 Mark Neale now has three in 10. We returned to the Ashton Arms before the Oldham game. As with most northern based games, we were joined by Tony, Adrian and Stuart. 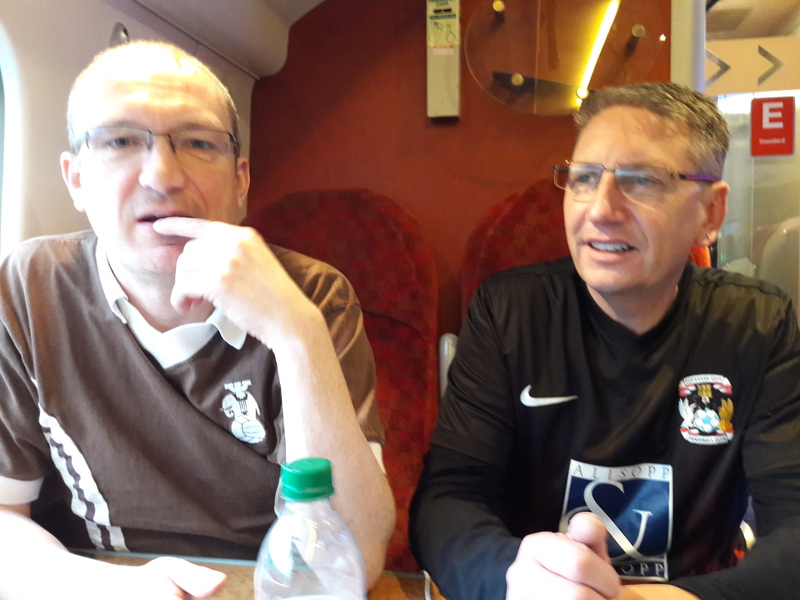 Below are Rob and Colin on train to Oldham and the sign at the Ashton Arms, which we perhaps should adopt. Even though it was Valentine Day, Rob Stevens invited wife Kelly, Ali and friends Rob and Ash (far left) from Manhattan, to the game. 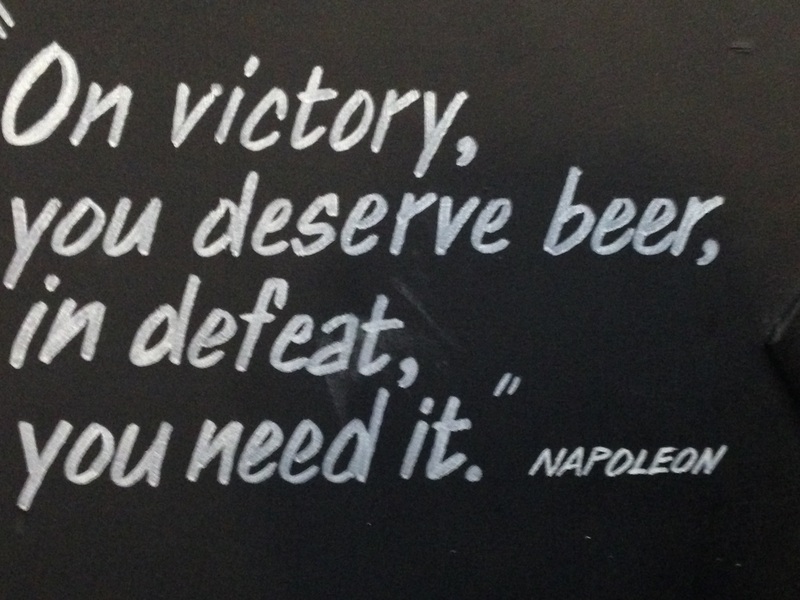 Pictured below at the Antelope in Surbiton before the game. Despite the cold evening and depressing circumstances the team finds itself, we had several members at Bury. 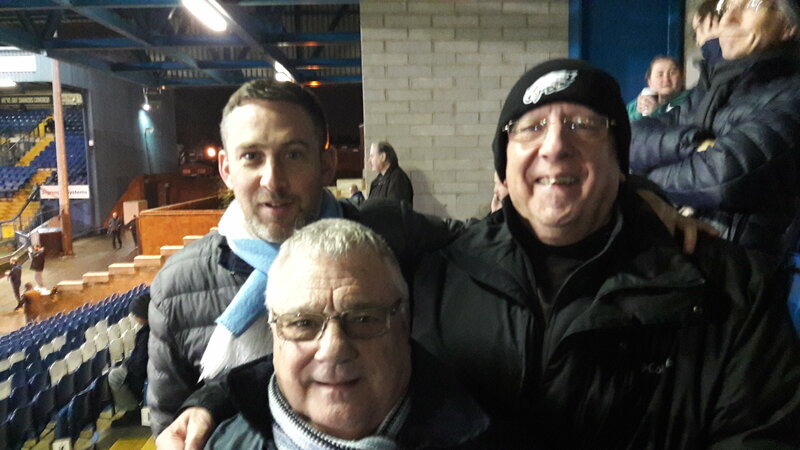 Below are Ben, Barry and Kev trying to be cheerful, despite traffic problems getting to the game. 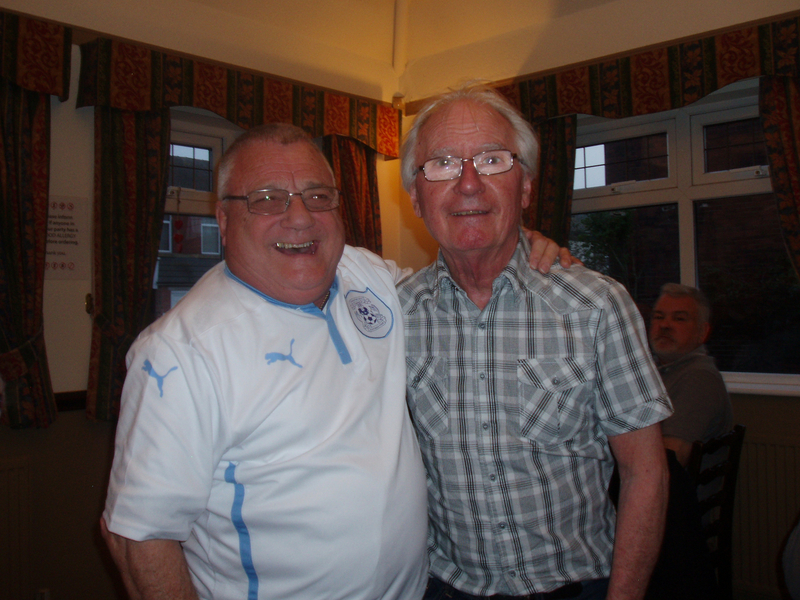 Jim Mcilwaine and Andy Knight were two who did make it to the Trackside before the game. 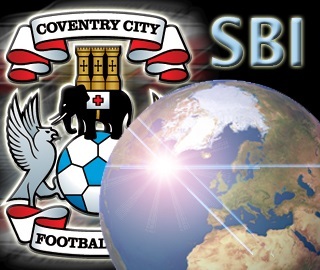 SBI members from around the world will be at the Checkatrade Final at Wembley or watchig the game on TV. For the Semi Final against Wycombe Jorg Nannastad informs me that over 30 Sky Blues supporters were in Oslo watching the game on TV. 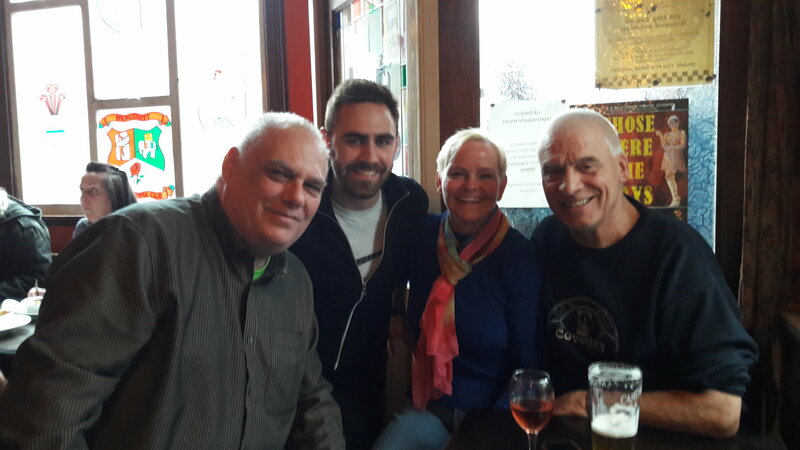 For the Swindon game we were joined at The Gatehouse Tavern by regular SBI visitors Dave Evans, from Finland, here pictured with his son, and Andrea and Albi Mozer, from Zurich. We had our Quarterly Committee Meeting on 9 February. Along with the standard busy agenda the committee discussed the item on recent fan behaviour and had asked for feedback from members on the issue. Colin wished to thank all those members who emailed him with their thoughts and comments. It decided that our neutral stance regarding making comments etc on issues outside of the running of CCLSC should remain the same, as agreed at the AGM in July 2016. Barry Chattaway has been proposed as a committee member at the Diamond Club. His appointment wil be ratified at the 23 rd March luncheon, where once again CCLSC will have a table. Check for updates on the CCLSC website http://cclsc.org.uk and follow us on twitter @cclsc. Support CCLSC when you buy online from Amazon at no cost to you. Just click the link below and CCLSC will receive 5% commission on all your purchases. Copyright © 2017 Coventry City London Supporters Club, All rights reserved.